Some people seem to be always late, no matter what the event or appointment. They’re like the Samuel L. Jackson character in Goodfellas, who is told by the Joe Pesci character that he’s always late and will even be late to his own funeral. Such individuals seem like an enigma to those who thrive to be punctual, a perverse art form from those who consummately delayed. There is also a science behind this, and some of it ties to qSample’s own research. The data comes from a recent piece by Science Alert. It details three personality traits that, alone or together, create that thermonuclear annoyance of being habitually unpunctual. Here they are, and then some solutions offered from an expert on tardiness recovery. One of the most obvious and common reasons that people are frequently late is that they simply fail to accurately judge how long a task will take – something known as the planning fallacy. Research has shown that people on average underestimate how long a task will take to complete by a significant 40 percent. This essentially means there are people who just are faulty at planning, and not intentionally holding up the Monday design meeting or enjoying watching you soaked as they pick you up late at the bus stop on a rainy day. But let us be grateful for those who heavily multitask in order to make the day happen, right? Not exactly. This is the second trait. In a 2003 study run by Jeff Conte from San Diego State University in the US, found that out of 181 subway operators in New York City, those who preferred multitasking – or polychronicity – were more often late to their job. The reasons stated center on the notion that multitasking makes it harder to maintain metacognition (or awareness). This confirms our findings that maintain Multitasking has a 41% higher chance of creating mental blocks; furthermore, it takes four times the amount of energy to recognize new things when multitasking. But multitasking is for aggressive, extroverted people who need to carpe diem at any cost! That’s a reason they are late. The data of Science Alert claims that Type A individuals are typically more punctual than Type B individuals. It has little to do with the intense environment Type A individuals commonly surround themselves in (including aggressive multitasking). The fascinating reason, according to the article, is that “Type A and Type B people actually feel time pass differently.” The Conte study mentions it found that for Type A individuals a minute passed in 58 seconds, whereas Type B people felt a minute pass in 77 seconds. This all may all seem trite and amusing, but the reality is that it’s estimated that the U.S. loses $90 billion each year as a result of people running late (while multitasking alone costs a staggering $650 billion). So we might as well find solutions—related but beyond less multitasking, working on better planning, and slamming a Red Bull to speed up time. 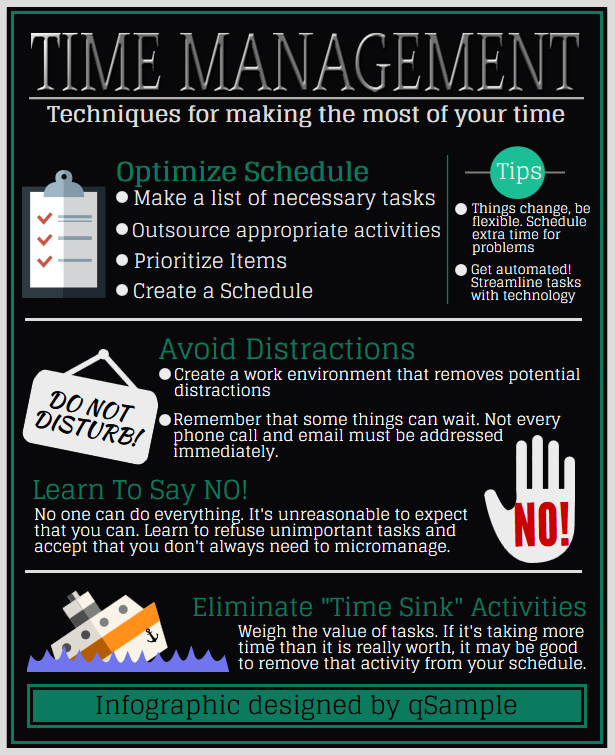 To assist, we’ve included an infographic at the bottom from our article The Art of Good Time Management. These methods are provided by a Fast Company article that dissects Diana DeLonzor’s bestselling Never Be Late Again: 7 Cures for the Punctually Challenged. Habitually late people engage in what DeLonzor calls “magical thinking.” It’s a delusion where an individual always expects the best possible scenario of any event, e.g. : driving through traffic, finishing work projects, or the length of a baseball game. DeLonzo says late people are regularly off of their time calculations by 25% to 30%. DeLonzor suggests relearning to read the clock by writing the exact time it takes to reach a destination or even with mundane activities like taking a shower. And then rewrite these times down every week until a strong average is understood. Punctual individuals are often early. Being late causes them stress and feeling rushed is uneasy. According to DeLonzo, late people do also feel stress when being late, but that doesn’t make them strive to be early, instead timing things to the minute. Always adding ten-minute increments of time to any event could go a long way to eliminating tardiness. According to DeLonzor, 45% of everything people perform on a daily basis is automatic. Humans are creatures of habit. Punctual individuals tend to have structured habits, constantly analyzing their daily activities and routines. In contrast, habitually late individuals tend to eschew structure and even fall in the ADD spectrum. DeLonzor recommends putting more routines and structure into life. One example would be doing everything to prepare for the morning the night before. Being on time often means being early and thus having extra minutes to burn. That also means often catching up on emails, reading notes, or even enjoying a meditative moment. That doesn’t sit well with habitually late individuals. They take a Furious 7 approach in enjoying the thrill of getting anywhere. Furthermore, they tend not to be comfortable sitting or waiting around, and that affects them unconsciously when it comes to punctuality. To negate this, DeLonzor proposes bringing an extra task or piece of literature for any appointment. All of this information won’t cure those Midwest blizzards or Gulf hurricanes that are authentic excuses for being late to work or dinner. Yet they will go a long way in curing those storms inside the heads of those who make us late for movies or that important sales appointment.